It has been a while since I last posted. "Thank you" to those of you who missed me and asked if everything was ok. I just made a decision (perhaps unconsciously) to be more present in the moment. I could spend hours a day on the computer, justifying this time knowing my husband, too, was on his computer...playing solitaire. But we were living separate lives, not connecting, even if we were in the same room. He would call out, "I love you!" I would respond, "I love you too!" He would repeat, "I LOVE you!" and this would continue until I made eye contact and said, "I REALLY LOVE YOU!" Then he would smile and say, "That's what I wanted!" You see, it's not what we necessarily say...or hear...it's that moment of connection that requires us to be PRESENT. So I'm spending more time being present...not just being there....and less time at the computer, being somewhere else. Being there for my husband. I will certainly post again. Being present doesn't stop the ideas swirling around in my head. Ideas that have no other outlet than right here. We are in a season that demands some major adjustments. Maybe that is why I sense the need to be present right now. For whatever reason, that may be more clear as time passes, I choose to be right here, right now. My blogging life will have to get in line. This was taken 11 years ago but the memory is still fresh in my mind. 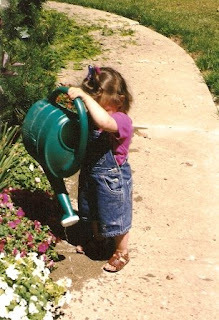 I know she got more water on herself than on the flowers but her intentions were the best! 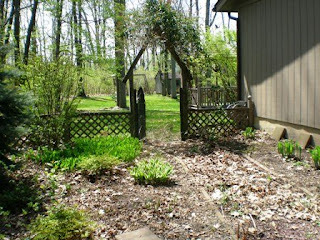 For more Wordless Wednesday participants visit 5 Minutes for Mom and the Wordless Wednesday Headquarters! I'm always looking for easy recipes with a "wow" factor and this one is a winner. I first saw it on a Tyler Florence "Ultimate Tapas" show and have served it twice over the past two weeks to plate-lickin', thumbs up reviews. I changed the proportions slightly since I buy 1 lb. bags of frozen shrimp - after all, that's what is on sale! These make a great first course or appetizer. I calculated 4 crostini per person and this served 4 people generously. Thaw shrimp if frozen and peel. Slice in half lengthwise and remove the little black thread (aka intestine - but who needs to know that!) This can be done hours in advance and the shrimp refrigerated. Thinly slice the garlic. It seems like a lot but it cooks down to a very mellow flavor. Add oil to a frying pan and warm over medium heat. Add garlic and cook for 10 - 15 minutes, allowing the garlic to gradually cook and turn a mellow brown. This is a slow process; you do not want to burn the garlic. Add shrimp to the toasted garlic and season with salt and pepper. The shrimp will cook quickly. Lift shrimp and garlic from the pan to your serving dish, toss with lemon juice and the chopped parsley. 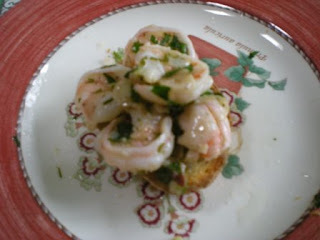 Serve shrimp along side the crostini and enjoy! For more great recipes check out the home of Tasty Tuesday. I mentioned last week that we had skipped church because my Honey was feeling a little under the weather. More precisely, v e r y, v e r y, t i r e d.
He saw his doctors last Tuesday and discovered that his BP was 90 over 60. His heart rate was 41. No wonder he was tired! They had already cut his beta blocker dose in half last November but now they have stopped it altogether. They really prefer a heart/stroke patient to be on a beta blocker but not if his heart rate continues to drop! So this past Monday, making sure the drug had left his system, we returned to the doctor to get a Holter Monitor which is like a little portable electrocardiogram strapped to my Honey's chest with four leads that attach with sticky pads to his body. He wore this for 24 hours and now we just have to see what his heart is up to. Either it is beating at a rate above 45.... or he's looking at a pacemaker. We are (not so) patiently waiting. This was my project yesterday afternoon. 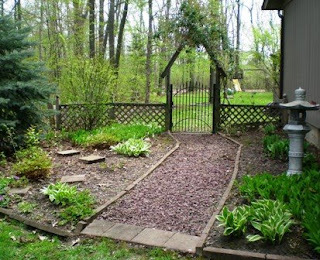 You can see how late our Spring is - still no leaves on the trees but the shrubs are leafing and the perennials are up. Still a few stubborn leaves to rake (even after 10 wheelbarrows full) but I think it's a big improvement! For more Wordless Wednesdays check out the WW Headquarters and 5 Minutes for Mom. We moved to this house in 1994. One of the attractions to this neighborhood was the predominance of basketball hoops in the driveways; with two teenage boys still at home, it was definitely a selling point. Fast forward to 2009. The basketball hoops are still there but the teenage boys are not. None. To our west we now have a young family with 3 little boys, the oldest of whom is in 1st grade. To our east is another young family with a 4 year old boy and a 2 year old girl. We love watching these children play outside our front window. They run back and forth across our yard, learning to ride bikes, playing super heroes and today, conquering a huge mound of topsoil that was delivered to one driveway. I wish I could share a picture, but they are not my children and they have a right to privacy. So when did this happen? When did we become the "old folks" on the block? Why didn't I see this coming? We crossed into Canada on Sunday morning to attend church. Then we had a little birthday party for our 6 year old granddaughter. About 3:00pm we set off for the U.S. border and round 4 of our border crossing challenge. In 3 out of the last 3 crossings we have been escorted from our vehicle for a secondary inspection, no explanation why. That and a DHS TRIP behind us, we approached the border not expecting that there would be any resolution yet. There was very little traffic; a customs officer was waving us into the last lane and we drove right up to the inspection booth. "We went to church and then to our granddaughter's birthday party," I replied, handing over our passports. The officer disappeared inside his booth to run our passports through his computer. We held our breath. He emerged from his booth, "Have a nice day," he said, returning our passports. YES! Happy dancing in the car! WOOHOO! No More red flags! No more black list! No more whatever-it-was-that-they-couldn't-tell-us that was sending us into repeated secondary inspections! This was the border crossing routine we knew and loved. Mom to five grown children, Grandma to eight, full-time caregiver to my stroke survivor husband, designer of eco-friendly children's party supplies, early morning walking maniac, Food Network groupie, tech challenged, believer in God's Word and seeker of joy in each and every day.